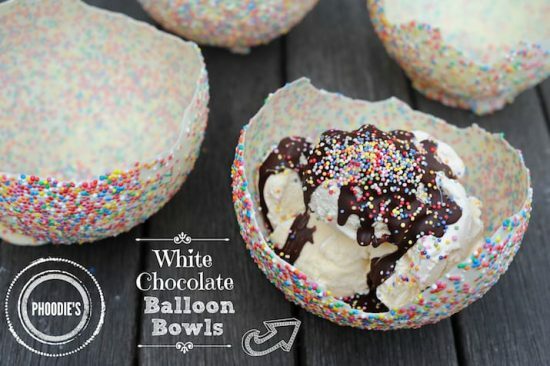 You’ve probably seen those beautiful looking chocolate bowls floating around Pinterest, well today WHOot contributor Phoodie shares her version and we can’t wait to make them. 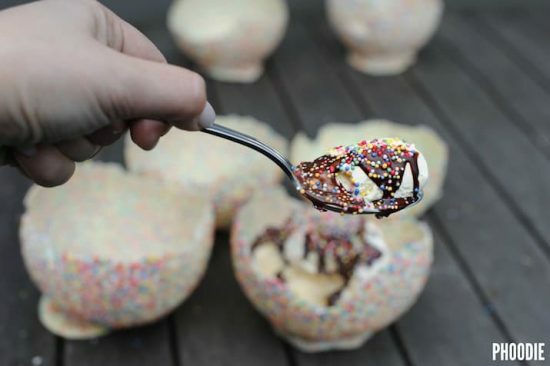 The good news is that these chocolate bowls are not difficult to pull off and Phoodie has come up with an amazing white chocolate version covered with sprinkles. 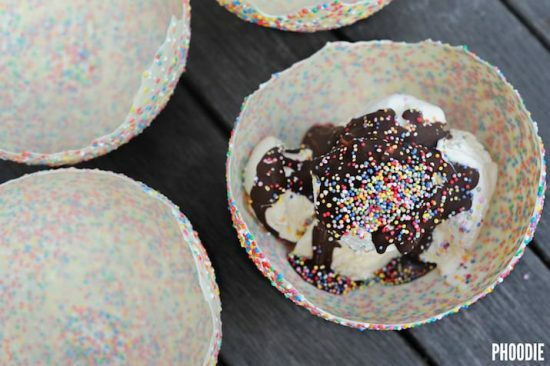 WHATEVER you want to fill the bowls with – I used creamy vanilla ice cream, Ice Magic topping and more sprinkles! Old school style! Fruit salad and yogurt also works really well as do lollies and candy bars for birthday parties! 1) Rinse (the outside only) and dry the balloons. 2) Blow up the balloons to whatever size you want your bowls to be, I blew them up to large grapefruit size. 3) Melt your white chocolate (either in bursts in the microwave or over a double boiler) a bit at a time. I divided the chocolate into 3 portions and melted enough for 2 balloons at a time. 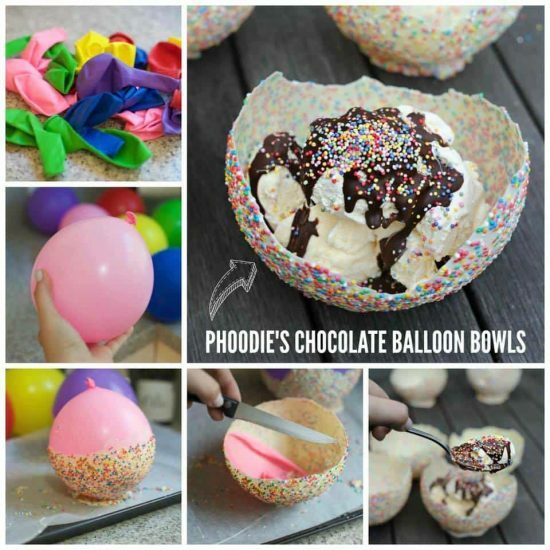 4) ALLOW THE CHOCOLATE TO COOL SLIGHTLY so that your balloons don’t pop when dipped! Whilst you are waiting for it to cool make the bases for the bowls by using a heaped tablespoon or 2 of the chocolate, and creating discs on your baking paper lined trays. Top generously with sprinkles. 5) Once the chocolate has cooled a bit, (I only let it cool for a couple of mins) dip the balloons, one at a time, into the chocolate. I found the easiest way to do this and get an even coverage, was to dip them in on their side first and then roll for 360 degrees to make sure all sides are covered. After this, I did another dip in, base first to make sure that it also had a good even chocolate coverage. Once each balloon is covered in a thick layer of white chocolate, hold them over the sink and sprinkle until you can sprinkle no more. Then place each balloon on a pre-prepared base, holding for a few seconds to make sure it’s connected to the disc base below. 6) Allow the bowls at least an hour to set on the bench (or at least half an hour to set in the fridge) before CAREFULLY popping the balloons (I used a steak knife!) and slowly peeling them away from the chocolate shell. Note that the shell, although sturdy enough to house lots of ice cream scoops, is still fragile and delicate. Once removed from the baking paper, it is best handled by the thicker disc base, not by the rounded edges of the bowl. 7) Fill with whatever your heart desires and ENJOY! Stores in tupperware in the fridge for up to 2 weeks. 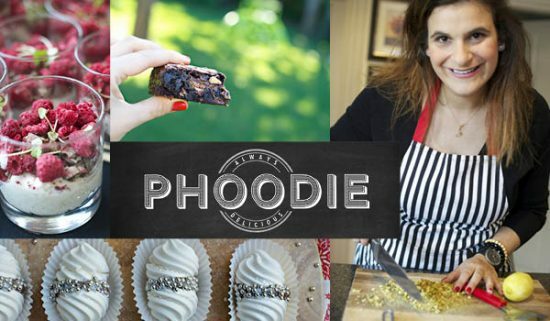 If you would like to follow Phoodie on social media, or see more of her amazing recipes on our site, check out the links below her picture! Most of her recipes are simple, quick and so good! Phoodie is a valuable contributor to our site and we’d love you to follow her on Facebook.